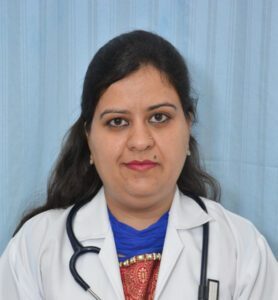 Dr Shruti Kainth completed her MBBS from Lady Harding Medical College New Delhi & done her Post Graduation training DGO from Maulana Azad Medical College New Delhi. Dr Shruti Kainth is actively dealing with High Risk Pregnancy cases with medical disorders like Heart disease, Diabetes, Epilepsy and Thyroid diseases apart from Normal pregnancy management. She has an experience of more than 7 years in a reputed hospital in Tricity. She specializes in Painless deliveries, Normal deliveries, Cesarean sections, recurrent abortions, D&C, Copper –T/ Mirena insertions in Obstetrics. In Gynecology, she is a trained expert in handling Ectopic pregnancy, Tubectomy , Ovarian cyst, Fibroids,Tubo- ovarian masses , LAVH, Total laparoscopic Hysterectomy , Vaginal Hysterectomy, Manchester Repair, Hysteroscopy , Prolapsed Surgery with Pelvic floor repair etc. She has a rich experience in dealing case of infertility and PCOS.